To many of us, coffee is life… That first cup in the morning is heavenly, and for some of us, can make the day better. Local coffee was not something that I had ever planned on, but then I met a couple who are making that happen. This project has been one of passion for this couple. They have had a lot of roadblocks that they have had to overcome to bring YEG their family’s best. The business is very new to Edmonton, so they are only available at farmers markets, handmade shows and through their website. You will be able to find them at the 124 Street Grand Market on Thursday evenings and the Collingwood Farmers Market on Sundays. They have a small roastery nestled in an industrial area located west on 118 avenue. If you are very lucky, you will get invited to attend a tasting. Santiago and Kristin are warm and inviting and will teach you everything that there is to know about coffee. From the growing of the beans, to managing to get the beans shipped back to Canada, and to the whole roasting experience. Quite a lot of work goes into your morning cup of coffee! Kristin comes from a teaching background, so she has her photo display boards all ready for her story telling time! The coffee is grown ethically/fair trade;  the surrounding farms think that the Santa Rita Farm in Columbia has got a great thing going. Happy farmers means a great product. Santiago loves his beans, and it shows! He will proudly show you the different types of beans that come in for roasting and how each one is different. The aromas that were in the air during my tour were heavenly. I was surprised by how short a roasting session actually was. It was only a few minutes! The Santa Rita Columbian roast is my favourite so far. I normally like anything from Ethiopia because of the complex flavours that the beans can present. The Santa Rita is bright and flavourful, and will make you want a second cup! You will need to keep your eyes on the website to see where the coffee will be available locally. I am excited to share the journey of this local startup. Recently, a group of local bloggers and media were invited to a tasting event put on by the brand new “Stages Kitchen and Bar” which is being run by the Silver Birch Hotels Management Group. This is the former “Mayfield Hotel”. The Mayfield Dinner Theatre has been an Edmonton staple since 1975 and thankfully will remain the “Mayfield Dinner Theatre”. Stages of course was named and themed to be a partner to the already established dinner theatre. Silver Birch has done a BEAUTIFUL job of renovating the aging building. They tried to use natural light wherever possible and modern conveniences are everywhere. “Plow & Harvest is proud to redefine the art of comfort food. Each day our chefs prepare handcrafted dishes using refined techniques and culinary traditions, continuing to hand down the stories of our farming partners’ rich, Canadian heritage. An expertly assembled and chef-driven menu centered on classics we all know and love – not fast-casual, but fresh-casual. We focus on the total guest experience, where our Brand Ambassadors attend to every need of our guests, sharing even more about our unique, locally-sourced menu offerings and seasonal specials. This was a “Sneak a Peek” event where Plow & Harvest opened their doors to the public to get the buzz going about the restaurant. The Grand Opening is August 16th. There is a VIP Media event that will be happening on the 15th, which I was unfortunately unable to attend due to Fringe commitments. I have had my eye on this restaurant concept for some time now. I love the fact that they use as many locally sourced ingredients as possible. I was very excited at the opportunity to be able to see and try the restaurant before the doors were officially opened. We were welcomed in a reception-style where our names were checked off a list and we were to seat ourselves. We were given a menu at the door. We arrived fairly early so we were easily able to find seating and browse the menu at leisure. There weren’t many details given in the invitation so we just had to observe what was going on around us to get the gist of things. Outside view of the menu. As you can see by the menu selections there are some mouth-watering choices that are available. I liked that there was no “crap” on the menu. Even the soda is cane-sugar sweetened. View from the right hand side of the front of house. Our server explained the restaurant concept to us and took our drink orders. I was happy to hear that they had some of my local micro-brewery favourites. Now here is where the chaos came in… I am always one of the first people in the door when I really think I am going to like a new restaurant. I eat out way too much. I have learned through experience that when a restaurant is opening their doors, the patrons need to be patient. There are always going to be bugs to iron out and there will often need to be a second visit when they have had a few days to get their feet underneath them. P&H was very good at keeping their Twitter posts up to date and apologizing for the bumps in the road. I heard a lot of complaining, and I saw the Chefs and the hosts personally coming out and speaking to to the guests to get feedback. We were unfortunately sitting in an awkward place on the seating map and often got passed by for the sample food items that were being served. What we were able to try was very tasty. Creamy potato soup topped with smoky bacon, sharp cheddar, sour cream and green onions. Creamy it was! This would be fantastic on a crisp Fall evening as a starter. Our server explained to us that these are fried twice. Once at a warm temperature and once at a hot temperature. This makes them crispy on the outside and still tender on the inside. Served with ketchup that I was surprised was from a bottle and not made in house. Baked Mac-N-Cheese with bacon breadcrumbs. They had me at Bacon! This had a really smooth and creamy texture to it. Nice and cheesy. The bacon breadcrumbs were a great taste pairing. I could have done without the green onions though – they were too strong and distracting from the taste. Pole-caught albacore tuna salad, lemon herb creme fraiche, melted sharp cheddar, and roasted tomatoes on toasted whole grain bun. Our server warned us that it was a very lemony taste experience with this item. It was lemony, but very good. The samples were all presented on white buns. This item would rock with the whole grain bun in the full portion size. A picnic favourite made with tofu, veganaise, P&H pickles, lettuce and tomato on toasted gluten-free bread. This was my least favourite experience of the night. One of the hosts had noticed that I had not finished it and asked for feedback. Please note; it is still a work in progress. It was very bland, even with the pickles. It just needed something to give it a bit more flavour. I suggested roasted sweet peppers. 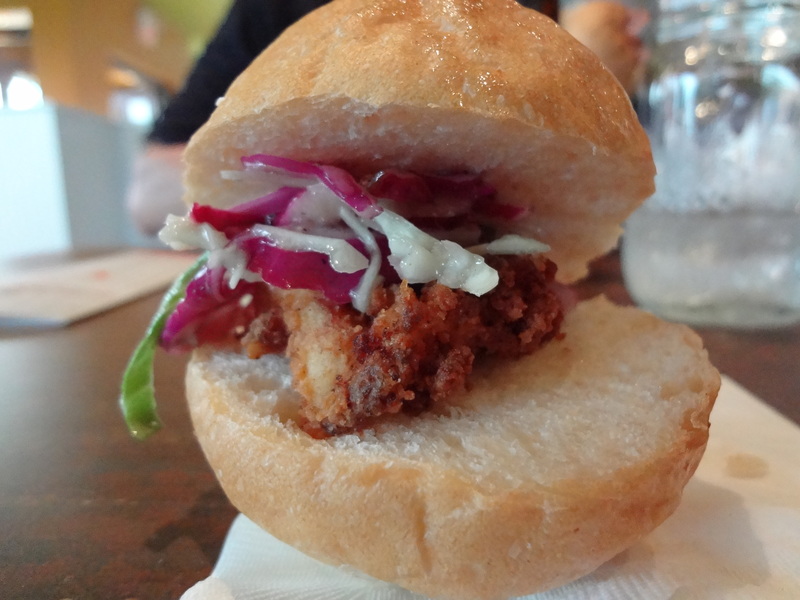 P&H original recipe fried chicken breast topped with Dijon mustard slaw, pickled red onions, and jalapenos. Served on artisan bread. As you can see, mine wasn’t so pretty, but this was the star of the show for the evening that everyone was rightly raving about. The chicken was crispy and tender. The jalapenos gave the taste experience a pleasant after-burn. Again, this was not the bread that was intended. The full plate experience would be an even better one. The Buttermilk Fried Chicken is also available as a “Big Plate” served with an additional side and artisan bread. So, congratulations to Plow & Harvest on opening a new restaurant here in Edmonton. I am sure you will take the feedback from last night and run with it as I suspect. What my fiance and I were able to try, we really enjoyed and will be back in a few weeks to try again. Thanks for the invitation! If you like comfort food, please support local farmers and give Plow & Harvest a taste.